The Procter & Gamble Company (PG) provides branded consumer packaged goods to consumers in North America, Europe, the Asia Pacific, India, the Middle East, Africa, and Latin America. The company operates through five segments: Beauty, Grooming, Health Care, Fabric Care and Home Care, and Baby Care and Family Care. Last week, this dividend king raised its quarterly dividends by 3% to 68.96 cents/share. This marked the 61st consecutive annual dividend increase for the dividend king Procter & Gamble. However, it also continues the recent trend of sub-par annual dividend growth for this widely held dividend king. For anyone who has looked at the financial performance over the past decade, the slow rate of annual dividend growth should not have been a surprise. Over the past decade, the company has been unable to grow earnings per share. However, it has continued increasing dividends per share, albeit at a reduced growth rate. 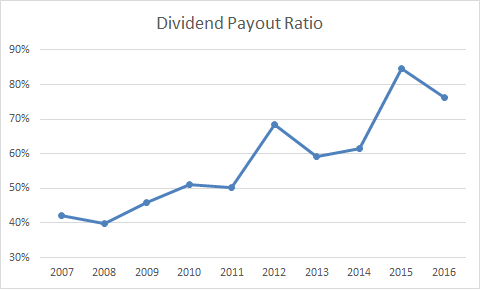 As a result, dividend payout ratio has been increasing. Currently, it is higher than 60%. I like to have a margin of safety in dividend payments. Some may state that the company should have been using that money paid out in dividends to spur its earnings growth. Unfortunately, I do not believe that things are cut and dry. First of all, if P&G reinvested all money back into the business, there is no guarantee that this would result in a profit. Companies should only reinvest money into the business, when they have a project that exceeds their ROI thresholds. Otherwise, you may end up cannibalizing sales, or reaching a point of diminishing returns rather quickly, and not seeing a huge benefit. In P&G’s case, it had way too many products. Hopefully, by trimming down the different product lines, we will see greater focus that would translate into improved bottom lines. The other thing to consider is that there have been factors weighting down on US multinational companies over the past decade. For comparison purposes, the earnings per share on S&P 500 have not risen much either over the past decade. Third, the company followed the same model of growing earnings and dividends for 61 years in a row, resulting in some amazing compounding in terms of total returns and dividend income growth. Unfortunately, sometimes things change The million dollar question to ask is whether these are temporary bumps on the road, or whether things will stay bleak ( and even become bleaker from here). I do know that impatient investors who sell at the first sign of trouble rarely manage to compound their money over time. The dividend is not very sustainable at a forward dividend payout ratio of 71%. 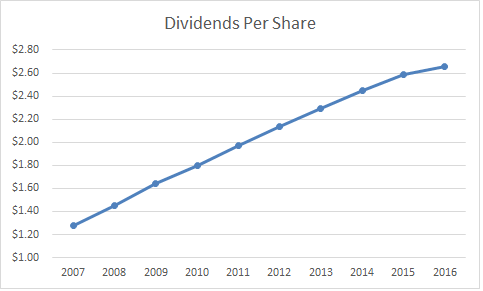 Without growth in earnings per share, dividends will likely reach a plateau soon, which would halt the streak of consecutive annual dividend increases. 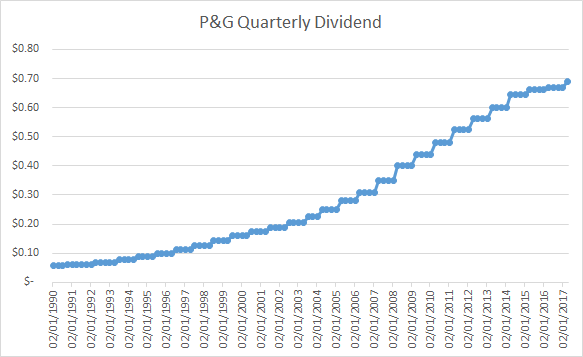 Rather than cut the dividend, I believe that Procter & Gamble will likely stop raising distributions in a few years, if earnings per share do not grow. The company still has an enormous amount of scale, and is working on becoming a nimbler player against competitors. In addition, Procter & Gamble is working on improving efficiencies, and cutting costs to bolster margins and profitability. I find Procter & Gamble to be a very stable company, with an assortment of products that have dependable sales. However, the stock is overvalued at 23 times forward earnings. 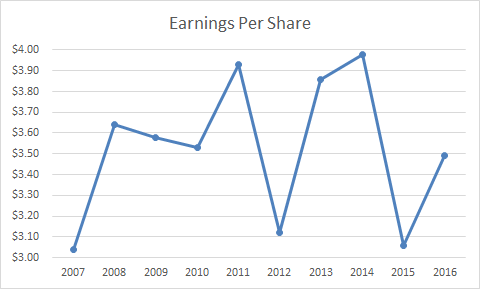 As was mentioned above, earnings per share have gone nowhere for a decade now. That being said, I can afford to get paid a 3.10% yield, while the company turns the ship around. I have some hopes that the $3.5 billion dollar investment by Nelson Peltz can lead to changes that will energize the company, and turn the ship around, while unlocking shareholder value. However, I would not be adding new money to work in this position. In fact, I have been allocating my Procter & Gamble dividends elsewhere for something like half a decade now.